OK, no real introduction is needed for this brewery. 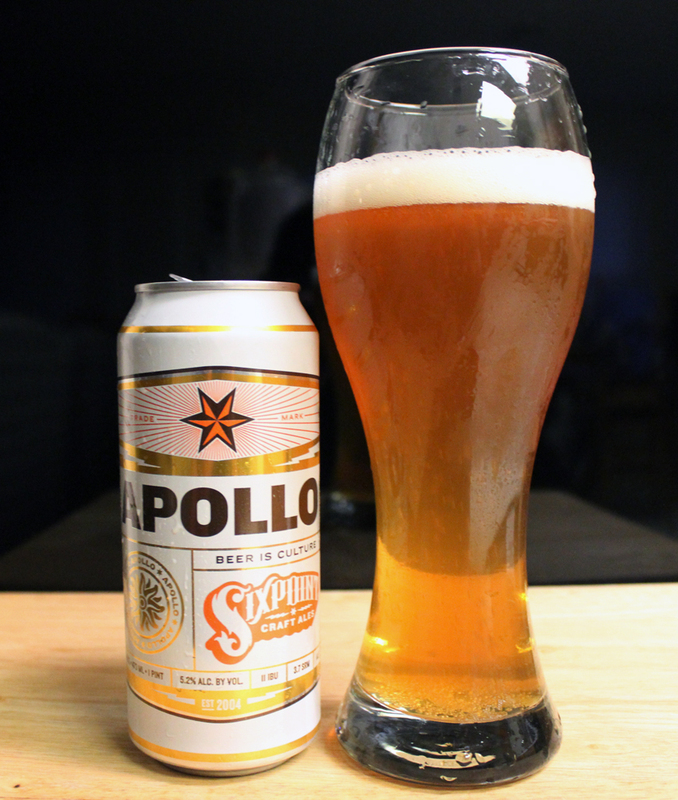 By now we should all know that Sixpoint makes very good, a bit over the top beers. If you don’t know. Check their website! Hah! This is my third time drinking this beer. The first one, my notes were erased so I didn’t get to post the review. The second, I was drinking at a friends house, and we shared this beer, but it was later in the evening, after having a few already, so I think my palate was wrecked, cause all I remember from that night was really not liking this beer. Knowing that I had another can in my fridge, I decided to give this beer another try with a fresh, clean palate with nothing else going on so I could completely concentrate on the beer. Using a Weizen glass the beer poured an orange color that was pretty clear, but there was some chill haze going on. The beer has a nice two finger wide wide bubbly head which retained, leaving great sticky lacing down the long glass. The aroma of this beer is interesting having a strong banana smell up front, then mixed with spices like clove and other earthy spices. I also pick up on a lemon zest-like aroma. Wet grass and a sweet tartness hits the nose at the end. This one is definitely different. Taste wise is also just as strange. There is a tartness that gives this beer a very subtle sour character to it. Don’t get my wrong though, this is nowhere near a traditional sour beer at all. The sourness is present, but more of a nice surprise gift with this beer. Other flavors present in this beer are banana, lemon, and a good amount of citrus/piney hops. There is a good backbone of earthy spices and malts which round out this wild complex beer. The body is a medium-light thickness with a smooth, easy to drink mouthfeel. There is that sour bite at the end which will leave your jaw tingly at the end of the drink. As I said before, this one took me a while to warm up to, and it took me three cans to get a proper review done. I’m sure now that the pressure of finding the specs out on this beer are over with, I will enjoy this beer again and again. It is definitely a good beer to drink in this Summer weather. The style of a Kristalweizen is a light, softer, filtered version of a Hefeweizen making this beer light to the taste, overall. So sit back and enjoy this beer on a hot Summer day. Metal Connection: I nerded out for this one. The word Apollo, obviously makes me think of space, and all that, so I chose a nice Metal version of a David Bowie classic song. Here is the Norwegian Black Metal band, Tulus (features members of Khold) covering “Space Oddity.” A perfect song to connect to a beer named Apollo. Enjoy!